With just over 10 million passengers each year passing through it, Calais is the busiest car ferry port on mainland Europe. The two ferry companies P&O Ferries and DFDS Seaways offer sailings - 24 hours a day, 7 days a week. The crossing time to the English port of Dover is 75 minutes. The Port of Calais is located in the northern part of the city and is directly connected to the motorway network (A16 and A26). It is also within easy reach of the city centre (5 minutes by car). P and O ferries also carry foot passengers to England. Are you travelling as a foot passenger and want somewhere to park your vehicle? Are you dropping off or picking up a foot passenger? A drop off/pick up point (15 minutes max) is available opposite the main entrance to the ferry terminal. If you wish to park for a longer period of time, you will find a large parking area opposite the ferry terminal building. 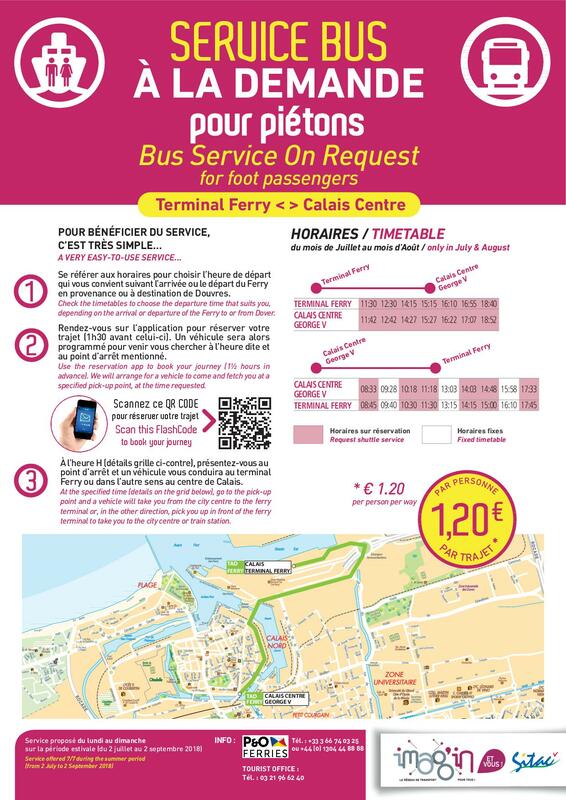 The terminal is less than 20 minutes’ walk from Calais-Ville railway station. JUST WANT TO VISIT ? You don't have to be a passenger to enter the ferry terminal building. A little tip for you : if you want to see all the port facilities, go for a coffee or a meal in the restaurant on the top floor (accessble by lift). From there, you will have a panoramicview of the loading and unloading areas. Since November 7, 2016 the wifi service from the port of Calais free and extended to all cross-Channel port and all the waiting areas. With a total bandwidth of 200 Mb / s, free wifi network port can now provide up to 750 concurrent connections. A "roving" system is also provided to allow passengers to move inside the port without having to reconnect. This new service is especially useful for travelers, tourists or professionals, few have French package for internet access. Accessible to all since calaisport_freewifi network, passengers will only have to answer a very easy registration form in order to connect. Once registered, they will be automatically recognized when their next bus, which is especially valuable for truck drivers regularly plying between Calais and Dover.